Home » music , songs , the eighties , we are the world » Blow-by-blow account of "We Are The World"
Blow-by-blow account of "We Are The World"
This past week was the thirtieth anniversary of the release of "We Are The World": the multi-multi-multi-talented collaboration of most of the biggest stars during the era. It was a song to inspire relief from hunger in Africa. Recording legend Quincy Jones miraculously corralled all of that musical force in the wee hours of the night right after the American Music Awards had wrapped. The result? Still a monument to pop culture at its best. Something we'll probably never see the likes of again. 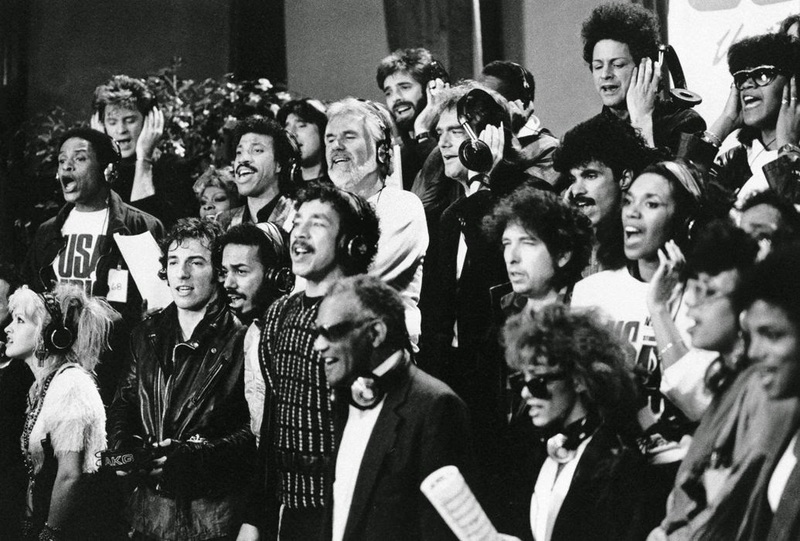 Rolling Stone has published an astounding account, practically moment-by-moment, of the night that Michael Jackson, Bob Dylan, Kenny Rogers, Diana Ross, Paul Simon, Cindy Lauper, Willie Nelson and 40-some of their closest friends (who also had Dan Ackroyd among them, strangely) came together to record the song. There is some really crazy material here. My favorite is probably the heated argument, at 1 a.m., between Stevie Wonder and Ray Charles (several hours after Wonder escorted Charles to the restroom in a true "blind leading the blind" moment). This was just about everybody who was major on the music scene at the time (except for Prince, whose conspicuous absence is remarked upon in the article). Can you imagine something like this happening today? We'd probably have Taylor Swift, Garth Brooks, Hozier, Lorde and maybe even "Weird Al" Yankovic along with dozens of others in the same studio. Personally, I can't see that. What can be said? It was the Eighties. This is a product of that era. And one well worth remembering. Can't forget Eminem. He would have to be in the group. Bob Dylan is touring again so he could come back too along with Willie Nelson and Stevie Wonder. Weird Al can do a separate parody of the song, make it a two-fer. I was 30 when it came out. Now I'm, older. That's a pretty bleak milestone. Don't look at it that way. There is no good life, or bad life. There is no old life, or young life or anything in between. There is just life, and however you make of it. Our local community theater guild just did a production of On Golden Pond, I saw it yesterday. It was really something to watch Norman go from the pessimistic, downbeat man approaching 80 and then see him evolve into someone who had a better appreciation of life than most ever have. I thought it was very sweet and uplifting (no doubt in large part because the cast did such an amazing job).